Anyone who has watched the Social Network movie about Mark Zuckerberg and Facebook know of the concept of Hot or Not image rating site. A hot or not site allows you to host a popularity contest on your site. In this article, we will show you how to create a hot or not image rating site in WordPress. First thing you need to do is install and activate the Hot or Not plugin. 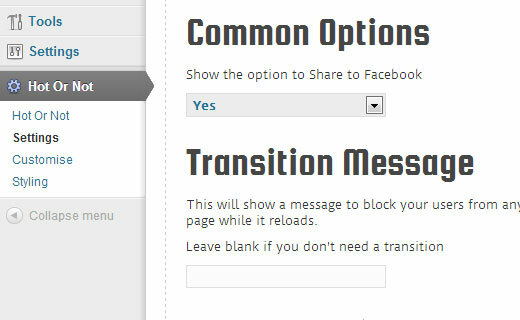 Upon activation, the plugin will add two new menu items to your WordPress admin sidebar. The first item is Competitors which is a custom post type. Go to Competitors » Add New to add a new competitor. The add new competitor page will look like WordPress post edit screen. To upload an image of a competitor click on Add Media and upload the image. On the right of your screen, you will see a custom panel for Groups. Groups are like categories. You can run hot or not competitions between members of a group. You can create multiple groups and a competitor can be part of multiple groups at once. Add a couple of competitors by uploading images. You can add multiple images for one competitor, write text below the image, and give the competitor a title. All of this will show up nicely during the competition. Now that you have added a few competitors in a group. Lets create a competition among them. 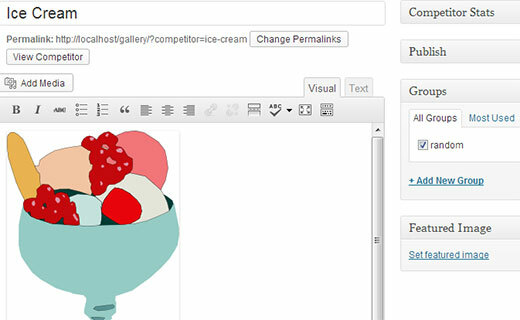 To create a new competition, create a new WordPress post or page. You will notice a lightening bolt icon in your post editor’s menu buttons. Click on the lightening bolt icon to open the shortcode generator. 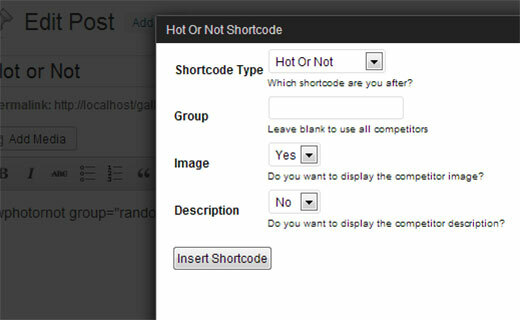 Configure competition shortcode and then click on Insert Shortcode. Publish the post or page and go to your live site to see the competition in action. Hot or not comes with some easy to configure customization options. Go to Hot or Not » Settings to configure these options. On this page you can set the maximum image size for the competitors, allow users to share a competitor on Facebook and show a transition message which is displayed when user has voted and the plugin is loading next competitor. Click Update All Settings to save your changes. You can even choose whether you want to use the words Hot and Not or something else. Go to Hot or Not » Customize to customize these options. To customize color scheme and visual appearance of the competitions, go to Hot or Not » Styling. 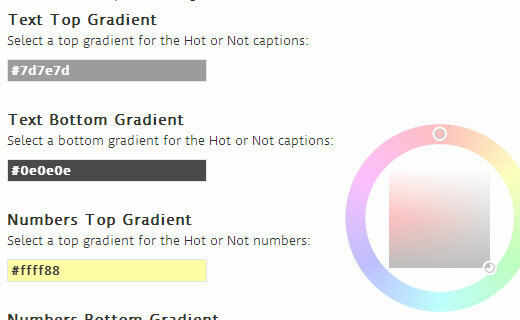 Choose colors for Hot or Not meter and text. Showdown contests like hot or not can be dangerously addictive for your website users which can help reduce bounce rate and increase time spent on page. 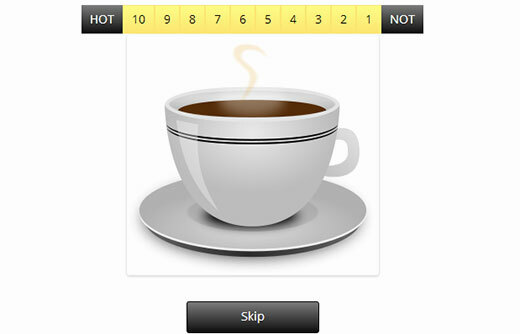 We hope that you liked our guide on how to create a hot or not image rating site in WordPress. Would you ever use this on your site? Let us know by leaving a comment below. This is a great tutorial, but how would you go about allowing a user to upload an image that can then be ranked in one of these groups? The plugin does not provide functionality to do that. But it can be done using a combination of plugins that allow users to submit posts and images into this particular post type. Could you elaborate on this? which plugins would I need to use?